The first Taco Bell to serve alcohol in the U.S. will be located in Wicker Park, which is found on the West Side district of Chicago, Illinois. While the establishment was scheduled to open over Labor Day weekend, a public opening seems to have been delayed. Nonetheless, those who have recently passed by were able to peer through the restaurant’s windows to try to catch of glimpse of what will be offered. 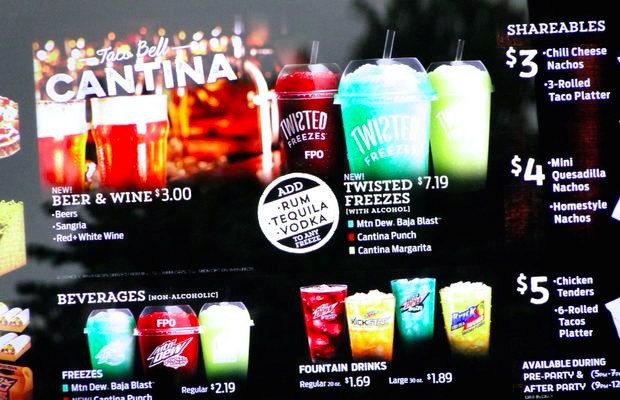 Other than the menu’s booze options, much is identical to any other Taco Bell eatery. Beer, wine and mixed alcohol freezes (or slushies that include vodka, rum or tequila) are notable choices. The latter of those options will be priced at $7.19, while the beer, wine and sangria will be $3.00 per serving. Below, you can see a few pictures of the Wicker Park T-Bell.